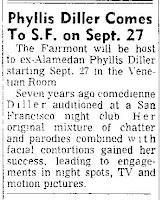 Found this article on George Carlin and Phyllis from the Daily Review in Hayward, CA, 18 Aug 1968. Quite a find on ancestry.com. This article is so good I had to share it. $500.00 a week Phyllis got at the Purple Onion in 1955! The Fairmount's Venetian Room is where my Grandpa had his wedding reception on February 14, 1942. How odd? 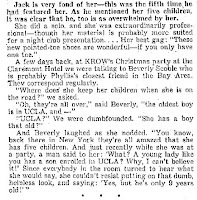 This article dated 19 Nov 1952, from the Daily Review in Hayward, jumped up at me while I was doing research on Phyllis. It says that she had a show and it was filmed on telefilm, an early form of television. 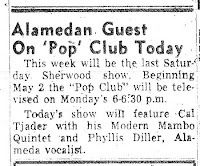 Don Sherwood gave the intro to her show, a real shocker. Both my Grandpa and Don had something to do with her career, starting it! This show never made it, I guess. Diller and Hope appeared on tv in 1964 with Dean Martin and the whole gang. I just love the photos of Phyllis in these 2 ads. Classic.